Come experience the sights and sounds of the night of Christ’s birth at Spotsylvania Courthouse Village. 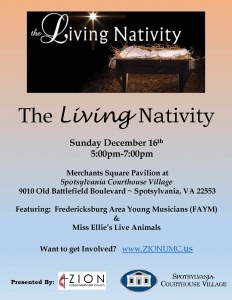 Zion United Methodist Church presents The Living Nativity, Sunday, December 16th from 5-7 p.m. at the Pavilion. This event is free.